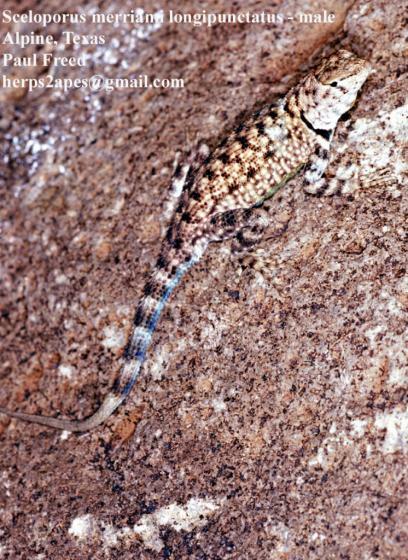 Can you confirm these amateur observations of Sceloporus merriami? merriami: Rio Grande and its immediate tributaries from western Brewster County to SE Val Verde County, Texas; Mexico (Chihuahua [HR 32: 276]). Type locality: East Painted Cave, near mouth of the Pecos River, Texas. annulatus: S/C Brewster County, Texas. Mexico (E Coahuila). Type locality: East slope of the Chisos Mountains, Brewster County, Texas. australis: Mexico (Coahuila). Type Locality: 15.6 mi (25.1 km) E Cuatro Ciénegas, Coahuila, Mexico. ballingeri: Mexico (Durango). Type Locality: La Campana, Sierra La Campana, municipio Tlahualilo, Durango (26°7'39.1"N, 103°41'00.0"W). 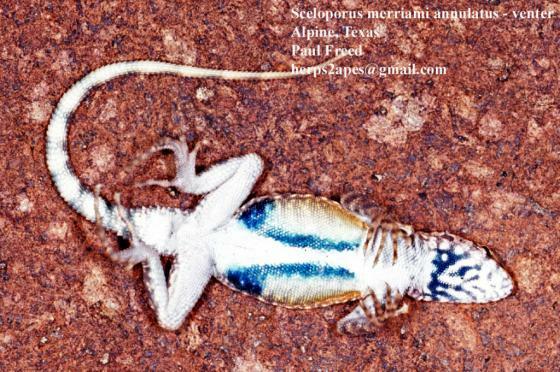 longipunctatus: USA (W Texas); Type Locality: Closed Canyon, 14.3 rd mi (23.0 km.) SE Redford, Presidio County, Texas. sanojae: Mexico (Chihuahua). Type Locality: Rancho Peñoles (27°7'49.6"N, 103°48'45.0"W), 1194m, Chihuahua, Mexico. williamsi: Mexico (Chihuahua). Type Locality: El Fortín, 51 air km W Rio Grande at 29°35’40”N. Holotype: UBIPRO 7456, collected 24 July 2001 by Julio A. Lemos-Espinal [sanojae]. Etymology Etymology: This form honors C. Hart Merriam, the originator of the life-zone theory of biotic ditribution, and chief of the Bureau of Biological Survey, predecessor of the U. S. Fish and Wildlife Service. 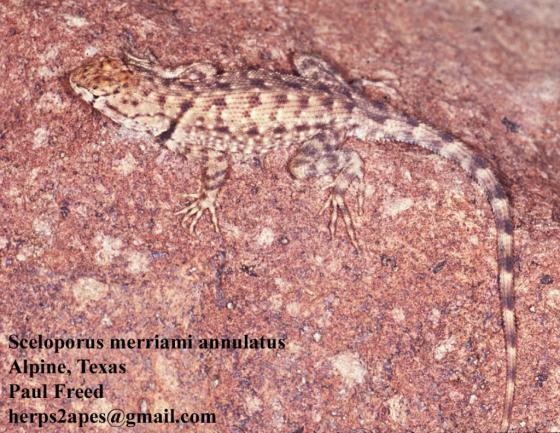 Etymology: S. m. annulatus is named after the Latin noun annulus refers to the banded subcaudal surface, such banding being one of the key characteristics separating this subspecies from Sceloporus merriami merriami. Etymology: S. m. australis has been named after the Latin adjective australis, "southern," referring to the range of this southernmost subspecies of S. merriami. Etymology: S. m. ballingeri honors Dr. Royce E. Ballinger, of the University of Nebraska, for his many contributions to herpetology and for guidance of Julio A. Lemos-Espinal to his doctoral degree. Etymology (longipunctatus): The Latin adjective long, "long," the noun punctum, "spot," and the suffix -atus, "pertaining to", refer to laterally elongate paravertebral spots, diagnostic of the subspecies. Etymology (sanojae): The subspecific matronym honors Susy Sanoja Sarabia, in honor of and gratitude for her long-term support of Julio A. Lemos-Espinal in the field, laboratory and at home. Etymology (williamsi): The patronym honors Kenneth L. Williams (1934-2017), a specialist in the classification of snakes and the herpetology of Mexico and Honduras. In the original description, two spellings of the name appeared: willaimsi and williamsi. BELL et al. (2003) designated the latter as correct.